Teeth - Lab Depot ltd. 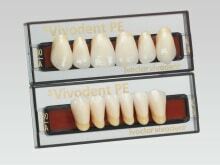 This range of tooth moulds has been especially designed to match the age and characteristics of the individual patient. Lifelike anterior moulds offer exceptional esthetic qualities and high wear resistance. The lingualized occlusion of this posterior tooth line offers an ideal occlusal scheme for removable, implant-borne dental prostheses in particular. Ideal distribution of oral forces in implant-borne restorations due to lingualized contact points. Tooth moulds suited to both “tooth-to-tooth” and “tooth-to-two-tooth” setup techniques. Time-saving design of basal surfaces. Wide design of facial and cervical surfaces for easy covering of abutments and other construction components. The natural looking restorations made with SR Vivodent DCL will give your patients good reason to smile. 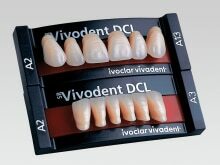 SR Vivodent DCL teeth are composed of a double cross-linked material. Toxicological examinations have confirmed the biocompatibility of this state-of-the-art resin. The new SR Orthotyp DCL teeth are made of the state-of-the-art DCL (double-cross-linked) material. These high quality teeth are available in A-D shades and in the popular Bleach shades, allowing them to be used in a wide range of prosthetic situations. The natural-looking restorations made with SR Orthotyp DCL will give your patients good reason to smile. 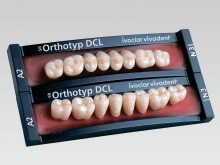 SR Orthotyp DCL teeth are composed of a double cross-linked material. Toxicological examinations have confirmed the biocompatibility of this state-of-the-art resin. SR Ortholingual DCL is based on a functional set-up concept. These teeth are particularly suitable for use with the lingualized set-up theory in the fabrication of implant supported dentures. The three-layer design imparts SR Ortholingual DCL teeth with a lifelike appearance, which makes them ideal for particularly demanding cases in the practice and the laboratory. The occlusal surfaces of the SR Ortholingual DCL teethh are specially designed for the lingualized occlusal scheme. SR Ortholingual DCL teeth are composed of a double cross-linked material. Toxicological examinations have confirmed the biocompatibility of this state-of-the-art resin. The six SR Postaris posterior tooth moulds made of the high-performance double cross-linked (DCL) material ideally supplement the SR Vivodent DCL anterior teeth. In all A-D shades, Bleach and Chromascop shades available. The 0-degree SR Orthoplane DCL posterior teeth are characterized by their simple occlusal shape. SR Orthoplane DCL teeth are particularly suitable for geroprosthodontics. The SR Orthoplane DCL line of teeth is designed for a wide range of applications. The teeth are characterized by their plain occlusal anatomy. 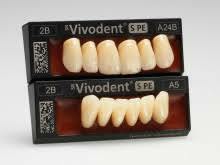 The SR Vivodent PE anterior teeth demonstrate a high degree of hardness, density, solvent resistance and shade stability. 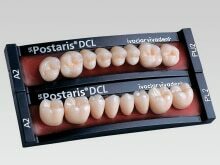 They are particularly suitable for complete denture prosthetics. 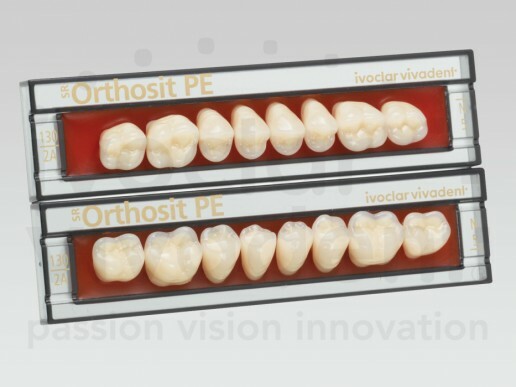 The SR Vivodent PE anterior teeth are also suitable for the fabrication of implant-supported complete dentures that have to fulfil exceptionally high esthetic demands. SR Vivodent PE teeth feature a subtle pearly shimmer. The SR Orthosit tooth line is especially suitable for complete denture prosthetics. It can be combined with SR Vivodent PE. The highly esthetic tooth moulds of SR Orthotyp PE are designed according to the Orthotyp principle. The teeth are characterized by their functional occlusal surfaces. The SR Orthotyp PE tooth line is particularly suitable for implant-supported complete dentures. The teeth can be combined with SR Vivodent PE teeth. Available in 20 SR Vivodent PE shades. SR Orthotyp PE is available in 5 N, 2 K and 2 T moulds.